Home » Technology » What is Laser Ablation? Laser ablation (LA) is a process in which a laser beam is focused on a sample surface to remove material from the irradiated zone. Laser ablation has been considered and used for many technical applications, including: the production of nano materials, deposition of thin metallic and dielectric films, fabrication of superconducting materials, routine welding and bonding of metal parts, and micromachining of MEMS structures. Recently laser ablation has gained popularity as a manufacturing process for solar cell (c-Si) edge isolation. Laser ablation is a dynamic technology platform for performing chemical analysis. LA generates a bright plasma on the sample’s surface. The light emitted from this plasma can be analyzed to determine the presence and concentration levels of elements in the period table — a technology known as LIBS. LA also creates a flux of fine particulates that can be readily transported to a secondary source for ICP-MS analysis (LA-ICP-MS). Laser ablation-based analytical techniques such as LIBS and LA-ICP-MS offer the ability to perform rapid chemical analysis directly from solid samples without the tedious and complex sample preparation involving toxic acid solutions. Thus, environmental-friendly or “green” chemical analysis has become a reality through LIBS and laser ablation. 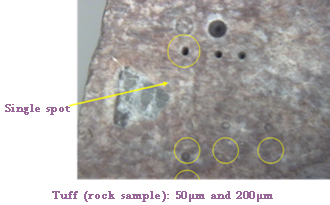 Craters produced on Tuff rock samples by laser ablation: both LIBS and LA-ICP-MS are capable of performing micro-analysis on geological samples. Laser parameters (energy, wavelength, pulse duration), sample physical/chemical properties as well as ambient gas will influence the various mechanisms outlined above; they often govern optical/physical properties of the generated plasma, the primary and secondary mechanisms responsible for mass removal, and the particle size distribution of the ablated mass. Consequently, a proper selection of appropriate laser parameters based on the sound understanding of laser ablation fundamentals is a critical prerequisite for achieving accurate and precise analytical measurements using LIBS and LA-ICP-MS. The scientific staff at Applied Spectra has over eighty year’s combined research experience with laser ablation fundamentals and analytical techniques. We welcome technical consulting opportunities. Contact us us to learn how we can simplify your chemical analysis and solve research and manufacturing challenges using laser ablation.